The latest issue of Cinema Adrift is now complete. Much work was put into it and the work from our contributors are all amazing. It is our second horror issue and is the end of an era for the 'zine. Moving forward we hope to evolve the 'zine and incorporate new and challenging ideas. Think of this as the end of our 16-bit era, our Final Fantasy VI. We are printing 100 copies of it ourselves but using MagCloud anyone has the ability to print their own copy either on demand or by purchasing a pdf and self-printing at home, but then you miss out on the paper stock/trim when using their service. 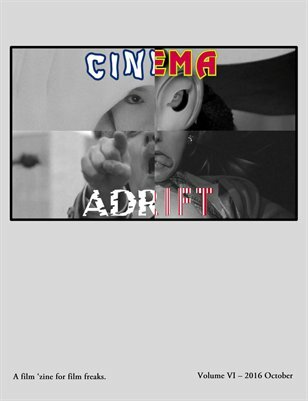 The sixth issue of Cinema Adrift. Included are write ups on the following films: Frenzy, Hausu (and other films by Nobuhiko Obayashi), Phantom of the Paradise, Creepy, Multiple Maniacs and more.